Click the DEPARTURE DATES TAB to begin reservation! 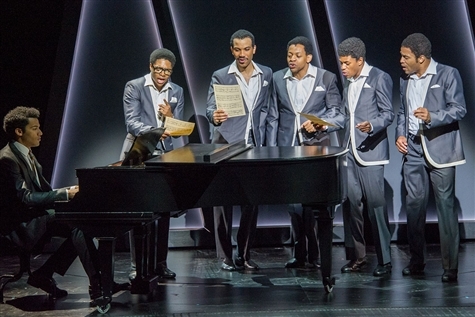 Ain't Too Proud follows The Temptations journey from the streets of Detroit to the Rock & Roll Hall of Fame. With their signature dance moves and unmistakable harmonies, they rose to the top of the charts creating an amazing 42 Top Ten Hits with 14 reaching number one. Through friendship and betrayal amid the civil unrest that tore America apart, their moving and personal story still resonates five decades later. After breaking house records at both Berkeley Rep and The Kennedy Center, Ain't Too Proud, written by three time Obie Award winner Dominique Morisseau (Pipeline, Skeleton Crew), directed by two-time Tony Award winner Des McAnuff (Jersey Boys), and featuring choreography by Tony nominee Sergio Trujillo (Jersey Boys, On Your Feet), now brings the untold story of this legendary quintet to irresistible life on Broadway. Get ready  cause here they come! This thrilling story of brotherhood, family, loyalty, and betrayal is set to the beat of the groups treasured hits, including My Girl, Just My Imagination, Papa Was a Rolling Stone, and so many more. The bus will drop off and pick up at Bryant Park on 42nd Street between 5th & 6th Ave.
We will depart at 6:30pm with an approximate arrival in the Capital District at 9:30pm. Non-stop each way.